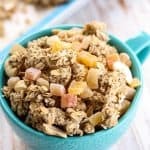 This easy, homemade Tropical Granola is vegan, gluten-free and the perfect topping to your morning bowl! Made with gluten-free oats and a tropical blend of dried mangoes, papayas, and pineapples, with cashews and coconut. This post is sponsored by NOW Foods. All opinions expressed, as always, are my own. Thank you for supporting Fit Mitten Kitchen! Sooo clearly I am thinking about summer already. Or just a warmer place in general. Last year at this time I was getting ready for my first ever tropical vacation in the Virgin Islands for my big bro’s wedding! Now this month Drew and I are casually discussing when and where we’d like to go on our “honeymoon”, since we didn’t really take one after our wedding in May. We’ve got so much going on these next few months I am honestly not sure when or where it is even going to happen. I would love to go to Europe (more specifically, the Mediterranean) but he is thinking Hawaii. Opposites attract I suppose, HA. 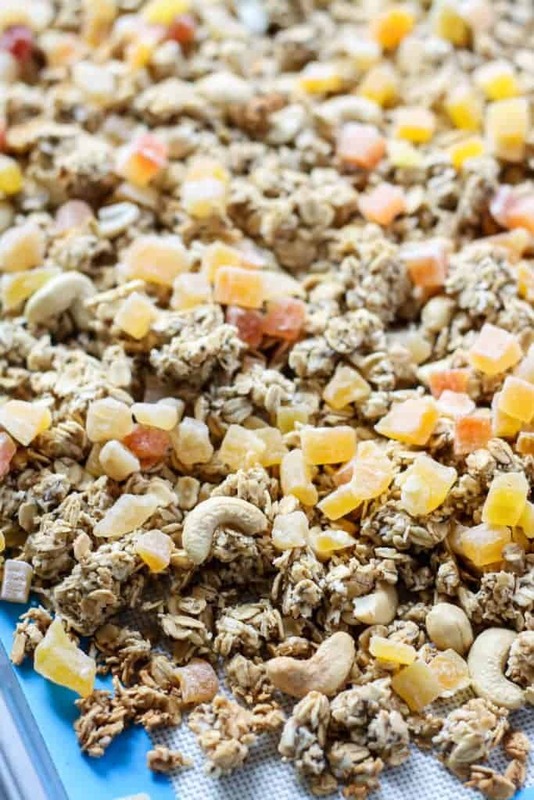 I guess I can just keep dreaming of any warm place while I top this tropical granola on anything and everything. It is made super special by NOW Foods exotic blend of mango, papaya, and pineapple. I love the texture of this blend! Chewy, lightly sweet, and it makes for the perfect addition to granola. 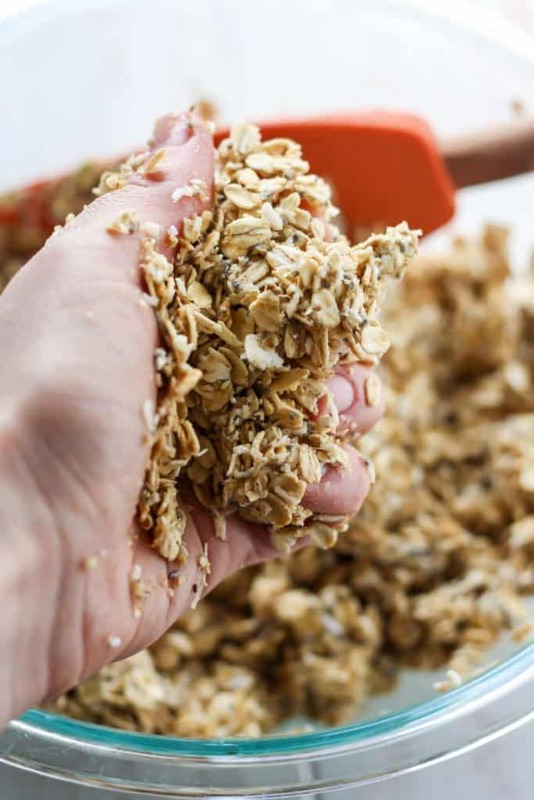 If you are new to my granola-making habits… You’ll find that my main ingredients are both old-fashioned rolled oats and quick-cooking oats, as well as a natural nut butter and maple syrup. ALSO, I’m not sure if this is considered weird or not… but I highly suggest using your hands at the end for mixing together all of the ingredients. 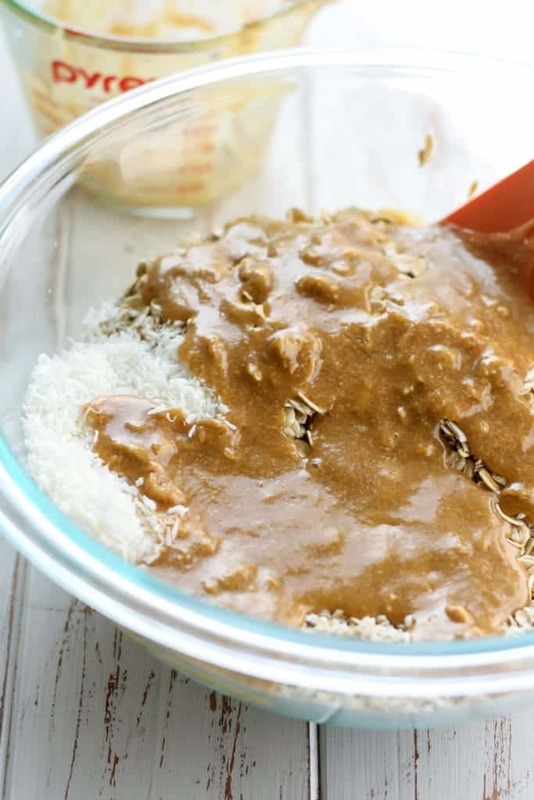 I use my spatula to start after adding in the almond butter mixture, but then switch to using my hands to make sure all of the ingredients are well coated with the almond butter and maple syrup. Call me weird (happens on the daily, long hurr don’t curr) but I swear by it. Plus it’s just fun using your hands! Come on now. Actually, that brings back memories of when my Pal and I would make cookies in her Mom’s kitchen… and I used to like putting my hands into the flour jar because I loved the silky smooth texture between my fingers. Sanitary? Mmmm, maybe not. Therapeutic? Yes. 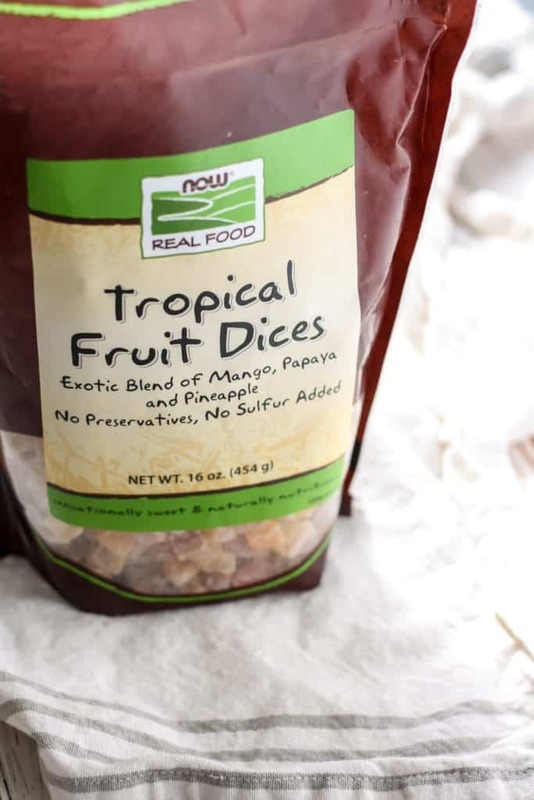 Once your granola has cooled, then you toss in your Tropical Fruit Dices. 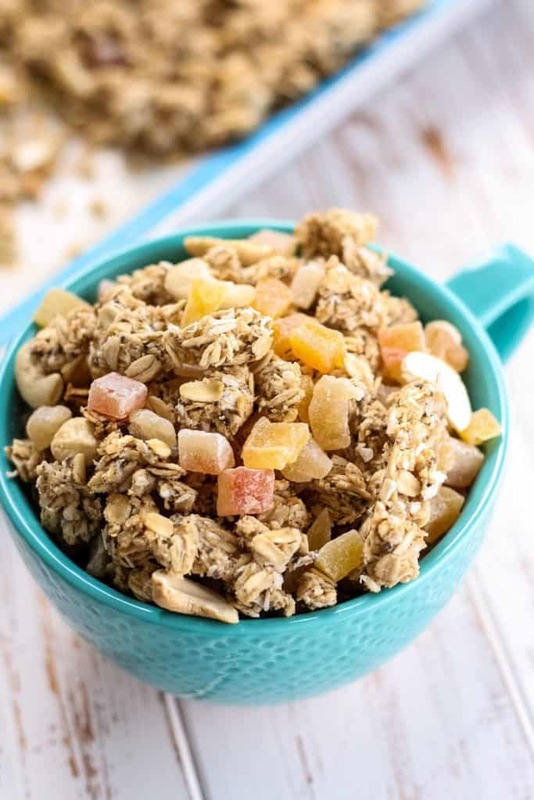 This easy, homemade Tropical Granola is vegan, gluten-free and the perfect topping to your morning bowl! Preheat oven to 300F degrees and line large baking sheet with parchment paper or silicone mat. In a small bowl, combine chia seeds with water. Set aside for a few minutes so “gel” can form while preparing rest of ingredients. In a large bowl add rolled oats, quick oats, cashews, coconut and ground ginger. Stir until combined and set aside. In a small bowl, add almond butter, maple syrup, and vanilla, and stir until well combined. (If almond butter is very thick, microwave with maple syrup for about 15 seconds.) Add almond butter mixture and chia seed gel to large bowl of dry ingredients, stir with large spoon until the dry mixture is well coated. Then, use your hands to fully mix and get the clusters ready. Spread/sprinkle the mixture evenly on prepared baking sheet. You should have clusters of granola already from working the mixture with your hands. Store in airtight container. Granola should stay fresh up to 3 weeks. Granola will make roughly 8-10 servings, about ½ cup each. *Using a mixture of old fashioned oats and quick oats helps create the clusters. But feel free to use all old-fashioned if you prefer. *Not stirring the granola as much will get you more clusters. I use a big spatula to “flip” the granola, rather than stirring. I also “sprinkled” the mixture on the pan, which resulted in more clumps from the beginning, then only flipped the granola gently to maintain the clusters. Watch granola after each time flipping to make sure it is not getting too dark, adjust time accordingly, as every oven is different! In general, where is one place you’d like to visit? Any country, state, province, island etc! *making something from FMK? Tag me so I can have a looksee 🙂 I LOVE seeing what you’ve made. honeymoon = hawaii!! completely amazing place – the scenery, climate, people, FOOD!!! Great minds think alike!!! Or is it that we’re just legit dying for Summer to be here. This is so pretty and I love that you put it in a cute little mug. I am obsessed with dried fruit especially the ones you have used here! Dried fruit is nature’s candy <3 Thanks Christina! AH! Jump in their suitcase, QUICKLY. I’m hoping each bite brings us closer to summer. That dried fruit combo sounds incredible! and so does this granola <3 <3 I want to sprinkle it alllll over a mango smoothie bowl! It is an awesome mix Leah! Highly recommend. Apparently you and I both had granola on our minds today! I love NOW foods. I need to give this bag of goodies a try. Two things: 1) I have that mug THANKS TARGET 2) go to the Mediterranean because when else are you going to? Actually, Hawaii is on my bucket list and I imagine they’re both super dreamy 3) Love granola and so, so ready for summertime! YAS Target <3 It was on an end cap, and naturally it spoke to me. Thanks for linking up with us this week. Looks quite tasty. Yum yum yum! I’m craving anything tropical right now…spring must come quickly! haha this recipe looks and sounds so incredibly yummy – can’t wait to give it a try! 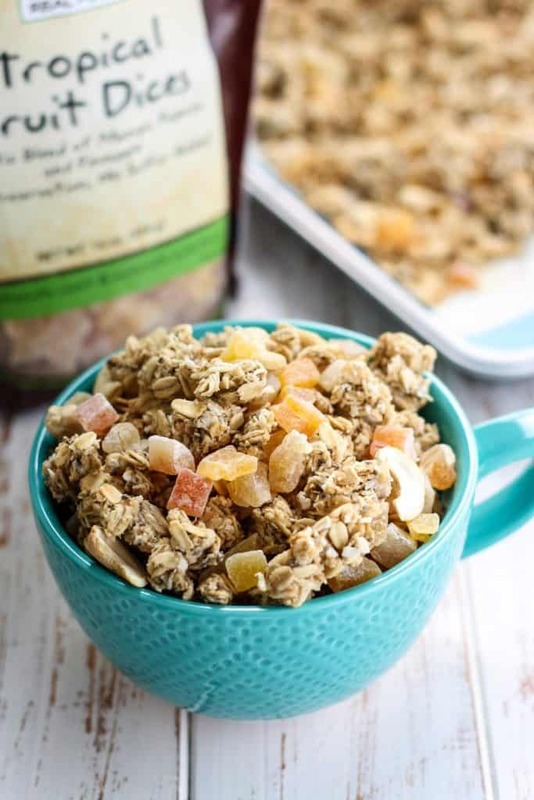 This granola looks dreamy and perfect for California’s summery weather! How I would love to be in Cali right now! Love the tropical twist. NOW foods are great I love everything I try from them. The Mediterranean sounds amazing. I think that would be such an awesome trip but Hawaii well how to you argue with palm trees and sunshine!! Sounds like a good honeymoon either way!! Def pinning this!! I am sure both places would be lovely but I’ve heard too many good things about the Mediterranean that I just need to see for myself! Mmmm anything tropical right about now sounds heavenly! Ray wanted to go to Hawaii too, but we don’t have enough time before his residency starts! This. 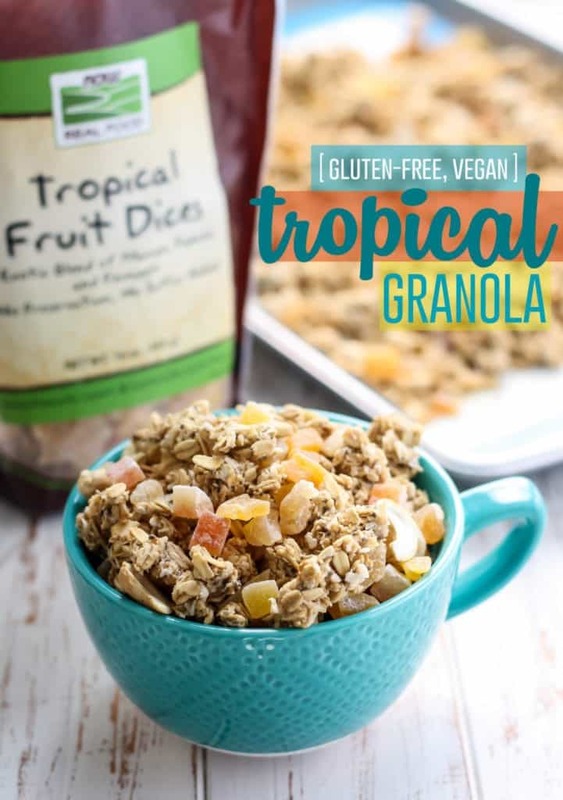 Granola looks so tasty, especially with the tropical fruit! This looks delicious. I am looking forward to trying this. 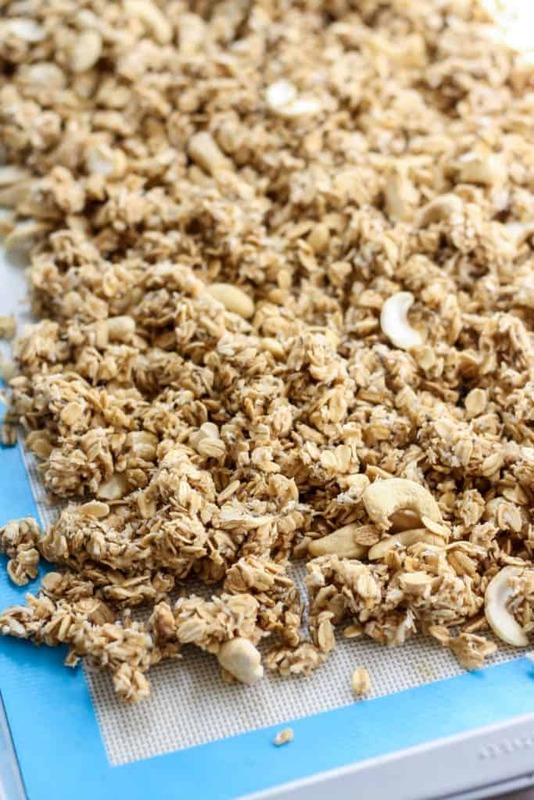 I usually grab a handful of granola just as a snack but I never thought of making it myself. My tropical dream is to go to Bora Bora and stay in the huts over the crystal blue water. Honeymooned in Tahoe, which is where I was married, not tropical but beautiful. I have been to Hawaii and loved it, definitely will visit again. Already warm & sunny here in California, just soaking up at morning sun. YES, I am SO ready for the tropics! I have a feeling one bite of this granola would take me there. It looks so good! I want to put some in my pocket and head straight to the beach. I can see the attraction to both the Mediterranean and Hawaii but I personally think Hawaii would be more relaxing right now, with what’s happening in the Middle East. Can you tell my husband forces me to watch the news/politics? Lol, it’s making me paranoid! We went to Maui for our honeymoon in 2014 and it was beyond incredible. I highly recommend it! You know we lived in hawaii, right? and got married there and honeymooned. haha. my father in law owned a coffee farm. I say we go back and you bring this granola. Deal? No way! I did not know that you lived there! That is awesome… well if Hawaii is what is decided on, I know who to come to for advice then! 😉 <3 DONE DEAL. Omg, looks like a tropical island party! 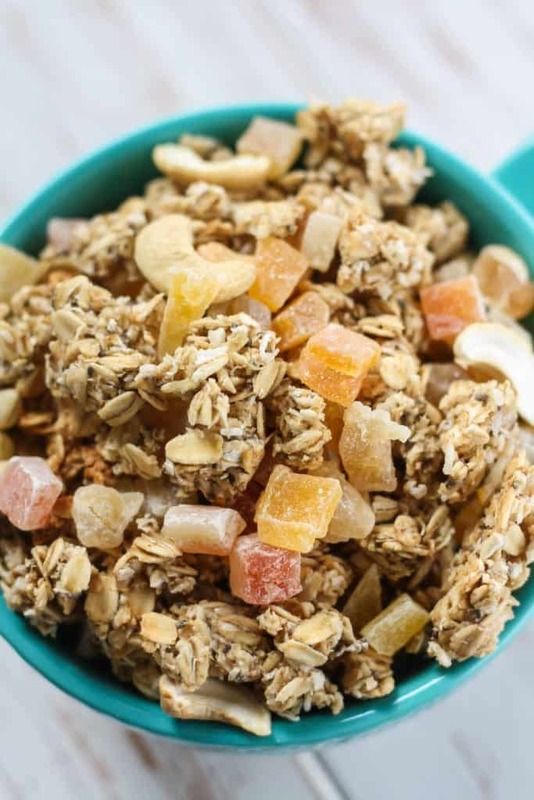 Ive never had a tropical granola before and this looks to DIE FOR! OMG drooling. I need this in my life. Ashley I love granola! This looks delicious.